I have written about my little run ins with the police before and getting tickets for going five over - yes FIVE MPH over the speed limit! Really? Don't you have some bad guys to catch instead? This weekend I was talking with my mother in law and she got pulled over for going too slow! I couldn't help but laugh and then keep laughing after she told us the story! Going too slow! She was actually just accelerating onto the road after having turned on it and then trying to obey the rules of the road with construction around! When she drank out of her water bottle the cop thought she was a drunk driver! If you know my mother in law you would know just how absurd this is! She didn't get a ticket and was told to step on the gas a little bit. 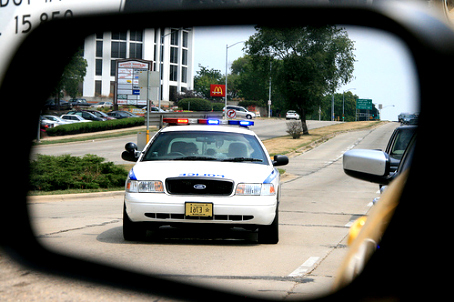 Since my tickets, I almost get an anxiety attack when I see a police car behind me! I actually start to have a feeling of loathing toward the car itself! In order to combat that feeling I have come up with a plan. 2. I am going to have Lola cry of a tummy ache and have her make puking noises. There aren't many people who can handle that sound for too long without feeling sick themselves. I'll have Jackson then start screaming he has an upset tummy too and is going to throw up as well. Now the children and I will start having to run drills. I think we will just start with talking about it at the dinner table when I can have all of their attention. Next, we will have to do practice runs where I will randomly pull over to the side of the road and we go through our routine. I'm not sure how Ry will feel about me using the kids in this way, so we may have to keep this quiet from him and I may have to stress that they only can play these games when it is only Mommy driving and no other adult is in the car, unless they get really really good with their acting in which case it is all about getting out of the tickets and no one has to be the wiser!! Yup, I think I'll put these plans in action this week!